Hey guys! Wooo Day 2 of my 12 Days of Christmas. So, here’s the story. On Black Friday of 2012 I went shopping at various places, one being Ulta, and they had these adorable little sets from OPI called “Stuff My Stocking” and I had to get one, of course. I then for that Christmas got a full size of one of the colors, so I have a total of 5 things to show. But first, I’ll show the mani I created with it. This mani is a few days old so that’s why there is wear on the tips, I actually came up with this idea when I was finished with this mani hahaha. I decided to use a couple of the colors as well as other colors from other random places; I put white dots on top to give it that messy snow look. I’ll bold the colors that are from this collection when they show up. Nail polishes used on all: Nail Strengthener by Nail Savvy with Glossy Glam & Whiteout by Rica. So as you can see I only used 2/3 colors and 2/4 polishes from this collection, but the mani wasn’t the main point of this post. The mani was an example of things I do using these colors because they’re pretty festive. My favorite from the collection is probably Gift Cards for Everyone because even though they’re all kind of sheer, I think Gift Cards is the one that would build up to be pretty on my skin tone. And I love purple! Haha, have a good day guys! Oh, almost forgot, as of today I’m going to start ending some days with a song. 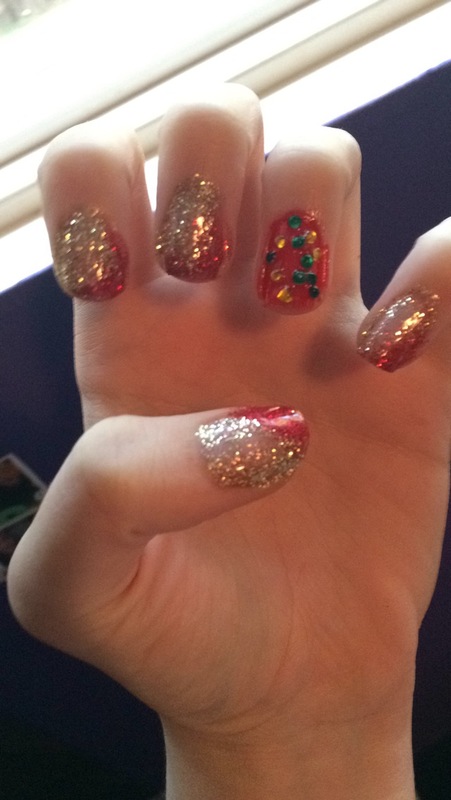 Exactly a year ago today I did my nails and got a pedicure, both Christmas themed. I thought I’d throw the pics at the end of this, I think they’re cute! Although I’m glad I don’t do manicures that sloppily anymore!